Equipment: digital camera with macro mode (I use now-already-old-and-obsolete-and-low-cost-but-three-years-ago-it-was-a-hit 1.3 Megapixel Olympus Camedia C900, also sold as D400 in some parts of the world), one lamp (see below), tripod, 1 piece of paper and a photo editing software. 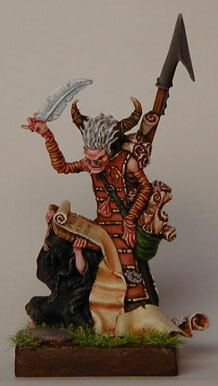 And of course the miniature I want to photograph. OK, now everybody asks - how can you get such great pictures with just one lamp? OK, here comes the advertising for a particular type of lamp. This is the best lamp, either for painting or for photographing. The lamp does not use a bulb, but a 20cm tube. This is the trick, as the light doesn't come from one point, the lamp doesn't serve as a single source of light, but a pretty good area! And for this reason, in the rare case you get a shade somewhere, it's still very soft shade. 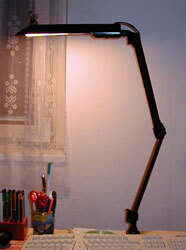 Even better, the lamp is mounted on 3-joints arm, so you can position it really the way you like. This is very important, as I put it very close to the "watching object", being it either the lens of the camera (for photographing) or my very own eyes (for painting). Such a lamp can be bought here in my country in several DYI stores, hypermarkets and of course stores with lamps. Of course the lamp is not the cheapest one, but it's still pretty affordable. Here it costs about 400 Czech Crowns, which is something like 12 US dollars. Alright, next page gets us to photographing setup! Fine, you see my camera is on tripod. This is very important, as we are going to photograph without using flash, the camera will use a long timing and simply we would not be able to hold the camera to get sharp picture. 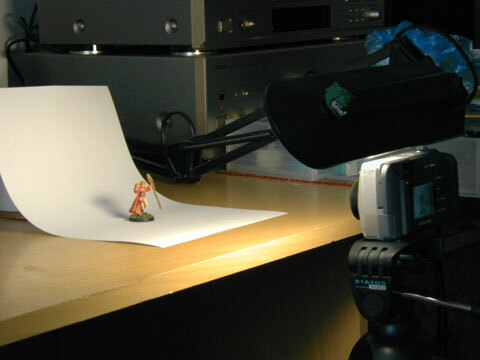 In fact we are making the picture from just few centimetres, so even tripod doesn't help that much, so on top of using tripod, I recommend to photograph using either timer or remote control, so you really don't touch neither the camera neither the tripod when the picture is actually made. So again, I'll repeat the most important things: use a tripod, do not use the flash, and do not touch the things when the actual picture is made, use camera built-in timer or use remote control for making the picture. The second important thing is the way the lamp is positioned. 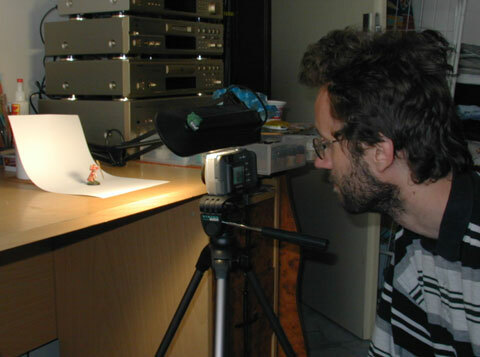 It is put as close to the lens as possible, so all places that the camera lens see get light. And as I explained on the previous page, this is a lamp that doesn't work as a single source of light, but an area of light, so we do not get any sharp shades at all. I use plain white paper for easier post-processing of the image in the computer, with any other background it wouldn't be so easy. OK, that's it! Now just take all the pictures and transfer them to the computer. On the next page we'll look at what more is needed to be done. Well, this is quite dark and not that fancy. So we have to do something about it. OK, to tell it technically, the problem with the picture is that the camera captured wider range of light that we would want. 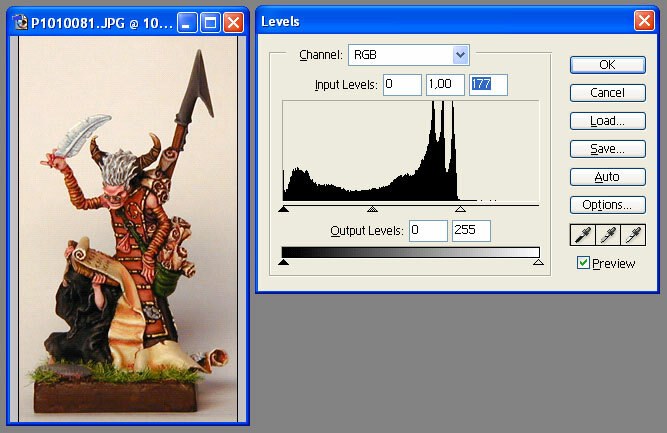 Now get any image processing program - I use Adobe Photoshop, but nearly anyone will do. From the commercial range the other famous and good ones are Corel Photopaint or Jasc Software PaintShop Pro, from the shareware and freeware range ACDSee and Gimp can do this thing as well. 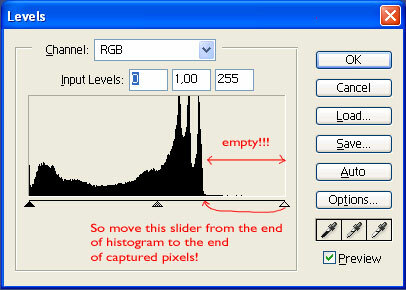 And yes, as I said, in the histogram you see the range of light that was captured by the camera. And if you think about what you see, you'll find out that the camera didn't get much of the very light and lightest light (lightest light, I kinda light it, oh I wanted to write I like it...). All right, we know that the camera got all the light, even the lightest one, but it simply expected even lighter points and this is why the image is darker, because the lightest light the camera got was not processed as the lightest one, but like it was somewhere in three quarters of the rage. 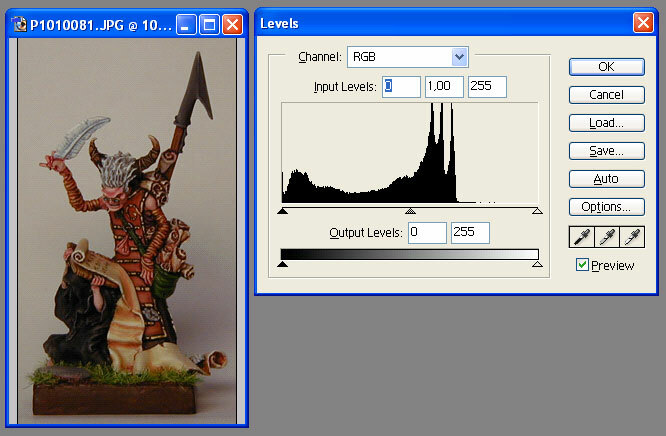 So move the slider representing the lightest point to a sensible place and whole picture will look much much better. Easy trick, isn't it! Voila! We've got perfect picture for our presentation on web. One last note to the Levels dialog: sometimes it happens, that the picture has a bit more of one color (green for example), or it misses some parts of colors (red, for example). With my camera, sometimes violet ends like a blue. Also this can be easily corrected with the levels dialog: on top of the dialog there is a combo, from which you can choose only a single part of spectrum in which you'll do the corrections. You can play with it and you'll quickly understand how to do this. Now, if you want, you can add other effects (lights from laserguns, motion-blur, flares, etc.) and get the final picture. And the last thing: Always scale the picture a bit down! With my camera, I'm able to get a picture of miniature that is larger than the screen of my monitor. This is very good for processing in Photoshop, it gives better results. But for presentation, the mini looks much better if it is scaled down. Well, that's it! It was a quick guide and I hope you liked it. Now I expect much better pictures of minis to appear on the web . Wow, this technique just flipped my modeling world upside down! I went out and bought a long bulb lamp, and my god, my pictures look so much better than before.